James Thomas Farrell (February 27, 1904 – August 22, 1979) was an American novelist, short-story writer and poet. A poet is a person who creates poetry. Poets may describe themselves as such or be described as such by others. A poet may simply be a writer of poetry, or may perform their art to an audience. He is most remembered for the Studs Lonigan trilogy, which was made into a film in 1960 and a television series in 1979. Studs Lonigan is a novel trilogy by American author James T. Farrell: Young Lonigan (1932), The Young Manhood of Studs Lonigan (1934), and Judgment Day (1935). In 1998, the Modern Library ranked the Studs Lonigan trilogy at 29th on its list of the 100 best English-language novels of the 20th century. 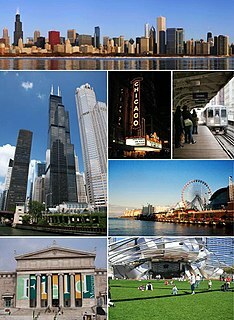 Farrell was born in Chicago, to a large Irish-American family which included siblings Earl, Joseph, Helen, John and Mary. In addition, there were several other siblings who died during childbirth, as well as one who died from the great 1918 flu pandemic. His father was a teamster, and his mother a domestic servant. His parents were too poor to provide for him, and he went to live with his grandparents when he was three years old. Farrell attended Mt. Carmel High School, then known as St. Cyril, with future Egyptologist Richard Anthony Parker. He then later attended the University of Chicago. He began writing when he was 21 years old. A novelist, journalist, and short story writer, he was known for his realistic descriptions of the working class South Side Irish, especially in the novels about the character Studs Lonigan. Farrell based his writing on his own experiences, particularly those that he included in his celebrated "Danny O'Neill Pentology" series of five novels. A teamster, in modern American English, is a truck driver, or a member of the International Brotherhood of Teamsters, a labor union in the United States and Canada. Mount Carmel High School is an all boys, Catholic high school in Chicago's Woodlawn neighborhood. Located in the Roman Catholic Archdiocese of Chicago, the school has been operated by the Carmelite order of priests and brothers since 1900. Several priests and brothers who teach at the school live in the nearby Saint Cyril Priory, though most of the staff consists of lay teachers. Norman Kingsley Mailer was an American novelist, journalist, essayist, playwright, film-maker, actor, and liberal political activist. His novel The Naked and the Dead was published in 1948 and brought him renown. His 1968 nonfiction novel Armies of the Night won the Pulitzer Prize for non-fiction as well as the National Book Award. His best-known work is widely considered to be The Executioner's Song, the 1979 winner of the Pulitzer Prize for fiction. In over six decades of work, Mailer had eleven best selling books in each of the seven decades after World War II—more than any other post-war American writer. Farrell was also active in Trotskyist politics and joined the Socialist Workers Party (SWP). He came to agree with Albert Goldman and Felix Morrows' criticism of the SWP and Fourth International management. 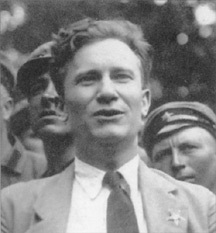 With Goldman, he ended his participation with the group in 1946 to join the Workers' Party. Albert Goldman (1897–1960) was a Belorussian-born American political and civil rights lawyer, closely associated with the American communist movement. Goldman broke with the mainline Communist Party, USA in 1933, joining the Trotskyist opposition, in which he would be a leading participant for the better part of the next two decades. Goldman is best remembered as a defendant and lead defense attorney in the 1941 Smith Act prosecution of the leadership of the Socialist Workers Party. Felix Morrow was an American communist political activist and newspaper editor. In later years, Morrow left the world of politics to become a book publisher. He is best remembered as a factional leader of the American Trotskyist movement. Within the Workers' Party, Goldman and Farrell worked closely. In 1948, they developed criticisms of its policies, claiming that the party should endorse the Marshall Plan and also Norman Thomas' presidential candidacy. Having come to believe that only capitalism could defeat Stalinism, they left to join the Socialist Party of America. During the late 1960s, disenchanted with the political "center", while impressed with the SWP's involvement in the Civil Rights and US anti-Vietnam War movements, he reestablished communication with his former comrades of two decades earlier. Farrell attended one or more SWP-sponsored Militant Forum events (probably in NYC), but never rejoined the Trotskyist movement. On the 100th anniversary of Farrell's birth, Norman Mailer was a panelist at the New York Public Library's "James T. Farrell Centenary Celebration" on February 25, 2004 along with Pete Hamill, Arthur M. Schlesinger, Jr. and moderator Donald Yannella. They discussed Farrell's life and legacy. Judgment Day (1935) This is the final part of the Studs Lonigan trilogy. Studs Lonigan: A Trilogy, ed. Pete Hamill (New York: The Library of America, 2004) ISBN 978-1-931082-55-6. Dreaming Baseball, eds. Ron Briley, Margaret Davidson, and James Barbour (Kent, Ohio: Kent State University Press, 2007). Louis "Studs" Terkel was an American author, historian, actor, and broadcaster. He received the Pulitzer Prize for General Non-Fiction in 1985 for The Good War, and is best remembered for his oral histories of common Americans, and for hosting a long-running radio show in Chicago. James Burnham was an American philosopher and political theorist. Burnham was a prominent Trotskyist activist in the 1930s, as well as a well-known isolationist. In later years Burnham left Marxism and became a public intellectual of the American conservative movement. His book The Managerial Revolution, published in 1941, speculated on the fate of capitalism. Burnham was also an editor and a regular contributor to the American conservative publication National Review on a variety of topics. Max Shachtman was an American Marxist theorist. He evolved from being an associate of Leon Trotsky to a social democrat and mentor of senior assistants to AFL-CIO President George Meany. Farrell Dobbs was an American Trotskyist, trade unionist, politician, and historian. Raya Dunayevskaya, born Raya Shpigel, later Rae Spiegel, also known by the pseudonym Freddie Forest, was the American founder of the philosophy of Marxist Humanism in the United States. At one time Leon Trotsky's secretary, she later split with him and ultimately founded the organization News and Letters Committees and was its leader until her death. Jean Louis Maxime van Heijenoort was a historian of mathematical logic. He was also a personal secretary to Leon Trotsky from 1932 to 1939, and from then until 1947, an American Trotskyist activist. Charles Curtiss (1908–1993) was an American communist. Young Lonigan is a 1932 novel by James T. Farrell. It is the first part of a trilogy about William "Studs" Lonigan, a young Irish-American growing up in Chicago. The Young Manhood of Studs Lonigan is a 1934 novel by James T. Farrell, and the second part of Farrell's trilogy based on the life of William "Studs" Lonigan. This novel covers about 12 years in Studs Lonigan's life, from 1917 through 1928. In this time, we witness the physical and spiritual deterioration of a boy whose life once held a great deal of promise. Judgment Day is a 1935 novel by James T. Farrell. It is the third and longest installment of Farrell's trilogy based on the short, unhappy life of William "Studs" Lonigan. The Workers Party (WP) was a Third Camp Trotskyist group in the United States. It was founded in April 1940 by members of the Socialist Workers Party who opposed the Soviet invasion of Finland and Leon Trotsky's belief that the USSR under Joseph Stalin was still innately proletarian, a "degenerated workers' state." They included Max Shachtman, who became the new group's leader, Hal Draper, CLR James, Raya Dunayevskaya, Martin Abern, Joseph Carter, Julius Jacobson, Phyllis Jacobson, Albert Glotzer, Stan Weir, B. J. Widick, and Irving Howe. The party's politics are often referred to as "Shachtmanite." Socialist Appeal was the name of a newspaper published by American Trotskyists from 1935 to 1941. It was started by supporters of the Trotskyist Workers Party of the United States in Chicago who had entered the Socialist Party of America in 1935 and was edited by Albert Goldman. In 1936, when the Workers Party formerly dissolved and entered en masse into the SPA and in August 1937 the publication moved to New York City and was re-launched as the organ of the "Left Wing Branches of the Socialist Party" but was effectively controlled by the unofficial Trotskyist faction within the SPA. The "Socialist Appeal tendency" split from the Socialist Party to form the Socialist Workers Party in 1938. The publication became the official organ of the SWP and continued as Socialist Appeal until 1941 when it was renamed The Militant, reverting to the name of the original (1928-1934) Communist League of America publication. James Patrick "Jim" Cannon was an American Trotskyist and a leader of the Socialist Workers Party. The Militant is an international socialist newsweekly connected to the Socialist Workers Party (SWP) and the Pathfinder Press. It is published in the United States and distributed in other countries such as Canada, the United Kingdom, Australia, France, Sweden, Iceland, and New Zealand. The Socialist Workers Party (SWP) is a communist party in the United States. Originally a group in the Communist Party USA that supported Leon Trotsky against Soviet leader Joseph Stalin, it places a priority on "solidarity work" to aid strikes and is strongly supportive of Cuba. The SWP publishes The Militant, a weekly newspaper that dates back to 1928. It also maintains Pathfinder Press. Lace curtain Irish and shanty Irish are terms that were commonly used in the 19th and 20th centuries to categorize Irish people, particularly Irish Americans, by social class. The "lace curtain Irish" were those who were well off, while the "shanty Irish" were the poor, who were presumed to live in shanties, or roughly-built cabins. The Studs Terkel Radio Archive is an archive of over 1,000 digitized audio tapes originally aired over 45 years on Studs Terkel's radio show on WFMT-FM or used in his oral history collections in the books Division Street America (1967) and Working (1974). Terkel donated a total of 5,600 tapes to the Chicago History Museum, which contracted the WFMT Radio network, to publish the recordings online. The bulk of the tapes are not yet digitized, but the archive plans to digitize and distribute as many as possible online. The American public radio network NPR is featuring many of the tapes during the week of September 25 - October 2, 2016. The Chicago History Museum is also working with the Library of Congress to make the tapes available online and to visitors to their buildings in Washington, DC. ↑ As reported in the New York Times on the occasion of Norman Mailer's death in 2007. ↑ Steven G. Kellman (December 23, 1999). "Steven G. Kellman on Studs Terkel". The Texas Observer . Retrieved June 4, 2011. ↑ 100 Best Novels « Modern Library. Modernlibrary.com. Retrieved on July 2, 2015. ↑ Saint Louis University Library Associates. "Recipients of the St. Louis Literary Award". Archived from the original on July 31, 2016. Retrieved July 25, 2016. ↑ "James T. Farrell". Chicago Literary Hall of Fame. 2012. Retrieved 2017-10-08. Wald, Alan M. (1987). The New York Intellectuals: The Rise and Decline of the Anti-Stalinist Left from the 1930s to the 1980s. University of North Carolina Press. ISBN 0-8078-4169-2. Wikimedia Commons has media related to James T. Farrell .